Ace Slots Pro, the best slot machine game on iPhone, iPad! Enjoyed by millions worldwide; Ace Slots Pro is the favorite slots game online providing unlimited entertainment, top-tier graphics, and high-quality sound effects. The best part is Ace Slots Pro is EASY to play and easy to win BIG! 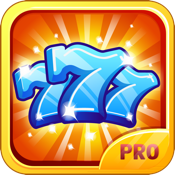 Play Ace Slots Pro now and MEET YOUR LUCK today!